I contracted Mycobacterium marinum infection while cleaning my Beta fish tank. I put my hand in the dirty water to get my fish and items out before cleaning, and unfortunately I had a small splinter cut in my finger through which the infection entered. I believe I contracted Mycobacterium marinum two years ago working on my 150 gal reef. I had gotten a whole shipment of infected fish but despite a lifetime of treating fish I couldn't identify the disease. There were nails sticking out in the sump area under the tank that stabbed me in the back of skull several times when I stood back up. Within about three to four weeks I started noticing bumps on body in lines that itched severely like being eaten by mites. Later I developed folliculitis in rings around the granulomas where the nails had stabbed me in the head. My lymph glands around the area became huge and I began to have overall lack of health and weakened immune system. I spent 10,000 dollars cash on doctor after doctor, every one told me something different and sent me to a different doctor. After around a year I began to have chronic lung infection seemingly tied to the sores as they flare up at the same time. It has been three years now and after two years of antibiotics off and on I only got results when finally given steroids and antibiotics for a couple months. I still have breathing problems and only a couple granuloma left and some permanent bald spots. I told the doctors over and over it seemed tied to my extensive fish and biology hobby and the wounds on my head, and none of them listened; they told me it was basically not possible. At the worst point I seemed to be losing nerve and muscle function in my feet and hands and face especially. My whole head became crusted with pus and all hair fell out while I lay in one spot for days. I still have not been diagnosed. I have never been sick much in my life and would like to see the end of this. I have no medical education but after three years of research I feel this is what happened. I have been diagnosed as having Mycobacterium marinum. I contracted it in October 2013 while fishing, cleaning fish or, my boat. In addition, I had a bad fall in the boat whereby landing hard on my elbow and shoulder. Several days later, a large bump appeared on the underside of my forearm which later, broke down into multiple granulomas. I went to my doctor primarily because of the pain I was experiencing in both my shoulder and elbow. I was injected with a steroid shot for that purpose which was a very normal treatment option. Little did anyone know! I was told that my bursar might have to be operated on if the pain did not get better but, I made the decision to wait since hunting season was about to kick off and I didn't want anything preventing that enjoyment. Again, little did anyone know what really was going on. The story continues but, I am currently one week post-operation having had my fourth debridement of the left elbow. 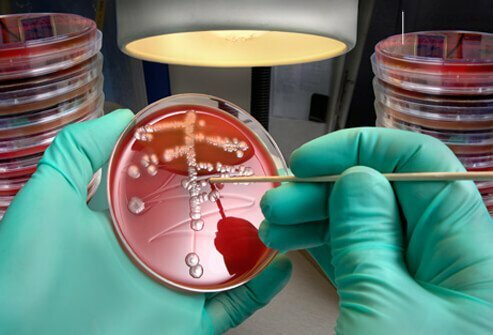 It wasn't until after my second surgery that my infection came back positive for AFB (acid-fast bacillus), and ultimately cultured out to be M. marinum. I have taken rifampin with clarithromycin, doxycycline and now, a double dose of Bactrim DS. I hope I am through the debridement process and on the way to be healed. While very rare, the infection has moved into the tip of my elbow. Currently awaiting tissue results. I understand that infection in the bone makes everything a little harder. Best of luck to anyone who gets this stuff. I was surf fishing in Melbourne, Florida and later noticed a very small cut on my right leg below the knee, origin unknown. Despite scrubbing with soap and water, alcohol pads and followed by Neosporin, the injury would not heal. Eight days later the wound was the size of a pea with a 1 inch red ring around it. Nine days later it was the size of a dime with a 2 inch ring. Ten days later it was painful and the size of a nickel with a 3 inch ring. I went to the hospital. The wound was cleaned. Originally it was diagnosed as a strep infection and treated with three different IV antibiotics twice daily with little improvement. Three days later infectious disease doctor diagnosed it as Mycobacterium marinum and prescribed a tetracycline orally. I went home, redness diminished, wound healing. I've been suffering with very sore hands, mainly in the thumb area for the last three years. I've been researching like crazy. I am not sure that I have this infection but a lot of the listed factors do add up. Three years ago, I developed a rash on top of both hands where the thumb and fore finger meet. I previously filed the nails on my dog and ran the edges on my hands to make sure that they were nicely smooth so as to prevent scratching. I didn't think much of it then. I also have a large above ground swimming pool. We also spend time at a local lake with our boat. We sometimes swim in the lake. I had the same itchy rash for two years. This last summer and fall I had no rash, but instead I had severe pain in my hands in the same exact area that the rash was in the previous two years. This all seems weird but at the same time, highly likely that it could be this mycobacterium marinum. I have not been diagnosed. The pain is very debilitating. I caught this mycobacterium marinum infection 4 years ago from fishing. I had 6 weeks of IV therapy, every day and a year of oral antibiotics. It was misdiagnosed by many doctors. I never went fishing again. l had been gardening and got a small puncture wound from brambles. A short while later developed 4 small puncture wounds in a line on back of my hand, they all became infected with pus, saw nurse, gp, ointments, wounds grew bigger reddened, had scan, no debris found, then skin specialist creams biopsy, thought to be psoraisis. Six months later gone from pin prick size to 2-3inch sq spreading. A new doctor asked if I had tropical fish, I have had for years, brought diagnosis of mycobacteria on antibiotics for weeks, cleared it slowly, but whilst still active jagged it on something, nail maybe? Small spot within, a year later only slight sign and marking of original problem, but the jagged spot has grown and got infected so back on antibiotics for weeks, cyclosporine type, back for referral in a few weeks, so far subduing infection, but some side effects. I am an 83-year-old man in good health. I got an infection in the skin of my finger, had it debrided, and have been taking Biaxin, etc. ever since. It has improved, but now looks like it is getting a little worse. I am at a loss. Has anyone gotten good results with another drug? It has been six months so far.